For over 21 years, Dr. Troy Dreiling has provided chiropractic care to the Vancouver community. Born in Portland, Oregon and a Vancouver resident since the age of five, Dr. Dreiling is deeply invested in the Portland/Vancouver community and strives to provide families with the highest level of chiropractic care and healing. Although Dr. Dreiling’s passion for chiropractic did not fully manifest itself until his college years, the interest began at an early age. At the age of 11, Dr. Dreiling jumped off a three-wheeler leaving him unable to stand up straight. After four weeks of chiropractic adjustments, he had full use of his spine again. In high school, Dr. Dreiling suffered from a shoulder injury while playing football. Once again, after only approximately four weeks of chiropractic care, he had full use of his shoulder once more. It wasn’t, however, until an injury in college that Troy Dreiling found his calling and passion for chiropractic care. While studying physical therapy at Eastern Washington University, Dr. Dreiling aggravated his original injury from the three-wheeler accident while training as a competitive body builder. Positive experiences with chiropractors from his past led him to seek out chiropractic care for this new injury. After a persuasive conversation with his chiropractor, Dr. Dreiling decided not to continue on the path to physical therapy and instead decided to pursue chiropractic. After finishing prerequisite courses at Clark College in Vancouver, Dr. Dreiling enrolled at Life Chiropractic College West in California. His bodybuilding and previous injuries showed him the benefits of chiropractic care in terms of back and neck health, but he did not discover the overall health benefits resulting from chiropractic care until early in his time at Life West. After learning that chiropractic did more than relieve back and shoulder pain, Dr. Dreiling sought out weekly adjustments for himself. As a result, he experienced relief from the sinus attacks and headaches he had been living with for over ten years. This discovery sparked a passion within him to show the world what chiropractic healing could do for them. Dr. Dreiling graduated from Life West in 1994 and was issued his license to practice as a chiropractor by the state of Washington in December of 1994. Since then, Dr. Troy has been serving the Vancouver and Portland communities by providing the chiropractic care necessary to better health and lifestyles. Through years of drive and determination, Dr. Dreiling has established a successful practice, Zenaptic Chiropractic in Vancouver, which provides excellent yet affordable chiropractic care to people of all ages. He is also a member of the Washington State Chiropractic Association and the International Chiropractors Association. Zenaptic Chiropractic has been awarded with a Best of Clark County Reader’s Choice Award five times since 2009. Dr. 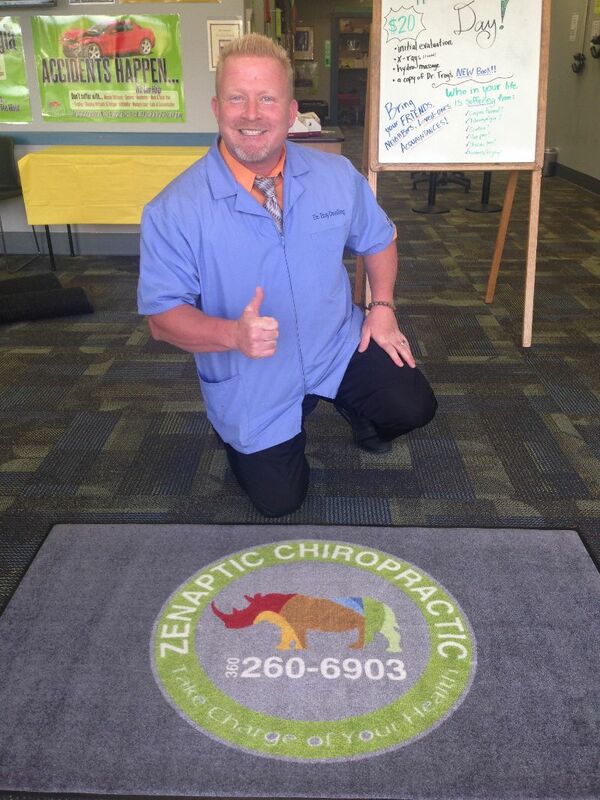 Troy along with his friendly and courteous staff at Zenaptic provide chiropractic services that strive to provide advanced chiropractic care, massage therapy, and nutritional recommendations. Dr. Dreiling has experienced first-hand the effective and healing potential behind chiropractic care and is passionate about providing that same care for people of all ages and with a wide range of conditions. In his 21 years of practice, Dr. Dreiling has made it his mission to help the people in his community find their optimal state of being through chiropractic care and healthy lifestyle education. Zenaptic Chiropractic’s website is continually being updated with information to best inform his community about the ins and outs of his practice and chiropractic services as a whole. He also encourages health through his radio sow “Today’s Health – Absolute Life Radio” on KPDQ 93.9 FM and 104.1 FM, The Fish. Dr. Dreiling has made it a priority to be involved in countless events focused on promoting healthy choices and lifestyles including Kids Day America, various fundraisers with the YMCA, and church events. His enthusiasm for healthy lifestyles and chiropractic care is evident in all that he does. As mentioned previously, Dr. Dreiling is a member of the International Chiropractors Association and has taken his mission to provide optimal chiropractic care outside of his community and into international communities. Dr. Dreiling served as part of a mission team to Panama that provided adjustments fro over 1,000,000 people. In addition, he has opened three chiropractic clinics in Romania where safe chiropractic care is now provided for the people of those communities. Dr. Troy has been interviewed on many different web sites, one of which is Inspirery.com, a site that featured engaging interviews with executives and entrepreneurs. Learn more about how Dr. Troy got started in business by reading his Inspirery interview.